In deciding how much you should be dredging your pond or ponds you may want to do a sort of "loss vs benefit analysis" - ponds which are soak-aways from heavily-fertilised agricultural areas are likely to be poor in wildlife and by dredging you may be able to remove polluted sediments and hopefully create silt traps and ways to buffer the pond from future pollution. It may be that your pond is in a marshy area and you may be better off digging small shallow pools rather than undertaking big excavations. Often it is easier and cheaper to create a new pond than to dredge an existing one. Digging new ponds can be much more useful to wildlife than planting trees - trees will self-seed if land is left alone whereas ponds are much less likely to create themselves. Indeed, very often the most useful way of improving a pond for wildlife is to reduce (or remove) overhanging trees which keep out light and can degrade the pond with heavy leaf-fall. According to The Water Habitats Trust there are some common myths about ponds such as the idea that drying out is disastrous or that all ponds need to contain deep water to be valuable to wildlife. Many ponds are seasonal or temporary and will dry out every summer - such ponds have received very little attention but they are in fact one of the most common freshwater habitats and they support a wide range of rare species including the Fairy Shrimp, the Mud Snail and the Natterjack Toad as well as some rare plants such as Adder's-tongue Spearwort. Dredging can easily damage the hydrology of these temporary ponds. Many people look at these "ponds" in their dry phase and think they are uninteresting and little more than muddy hollows and are determined to make the water permanent, but this can be damaging. About half of freshwater plants and animals are tolerant of periods of drought and even though fish will perish, other species will thrive just because of the absence of fish. Dredging small ponds can be done by hand with spades and forks - long curved forks are sometimes used (called chromes) - but for larger ponds dredging machines will be needed. Whether you are dredging with machines or working by hand it is advisable not to work alone because soft sediment can be dangerous. A recent pond dredging exercise that we did in Kent left one digger stranded - and slowly sinking - so the presence of a second digger saved the day (as well as saving the digger!). In this excavation we also discovered the difficulty of disposing of the sediment which was very wet and slurry-like. We had initially planned to pile it up, remodel the banks and use it to create a new island but in fact we had to spread most of it over quite a wide area. The danger with disposing of this slurry is that if you dump it too close to the pond it will simply wash back in with the next heavy rain, but you also need to be careful not to drop it onto very different habitats which may be damaged by a different soil type. Most ponds do not have linings unless they are in chalky or limestone areas. These linings can be plastic sheets or layers of clay - in either case dredging needs to avoid piercing these linings. 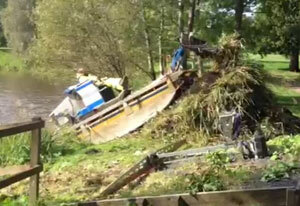 Some dredging is about removing built up silt and but often it's about removing a dominant plant, often non-native. The short film clip above is of an exercise done largely to reduce the build up of reeds in a pond at Gleneagles in Scotland. This was being done in autumn which is usually a good time for dredging as water levels are at their lowest, and it is also typical of a dredging operation in that it is done without having to drain the pond. Specialist companies have diggers whose arms have a long reach, often as much as 18 metres. In this case if there is access from both sides, a pond with a width of 36 metres can be successfully dredged. If the pond is larger than this you may need to use floating diggers or a drag line. Another option is to use a sludge pump which works by sucking mud from the bottom but they also need storage lagoons as you cannot just pump into streams and rivers in case of causing pollution. What is your experience of dredging a pond? Many woodland owners have ponds which they are managing for wildlife so please share your ideas. we have a similar dilemma with some ditches that criss-cross our marshland to help drain it. we scoop out the ditches every so often but in doing so disturb wildlife and create unsightly heaps of spoil (which soon grow over of course)….but it is important to keep the ditches clear and functional. Creating a woodland pond and encouraging pond life.